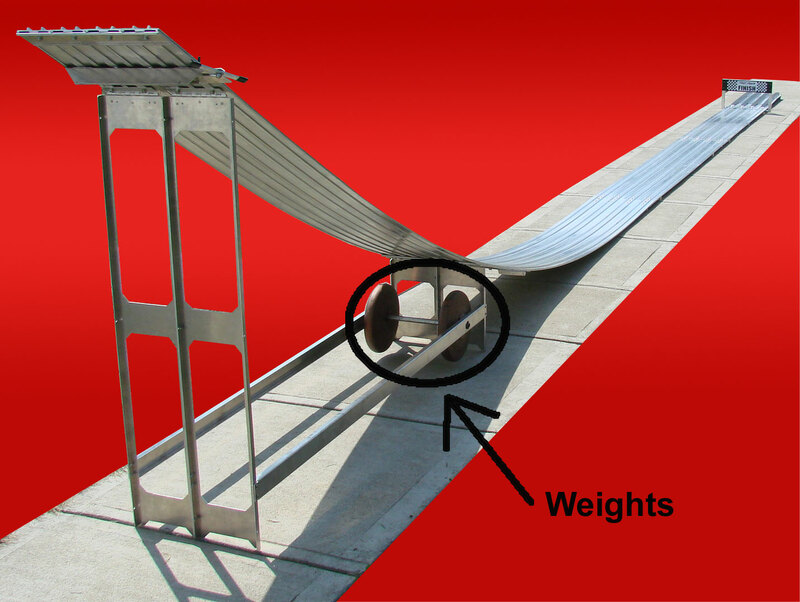 Our Freedom aluminum tracks were designed by a team of MIT engineers based on Cub Scout Leader "How-To Book" specifications to be durable, easy to assemble and easy to store. We now manufacture all of our tracks with the new Quick Pack Track Design that offers faster, easier setup and tear down of your Freedom aluminum track. 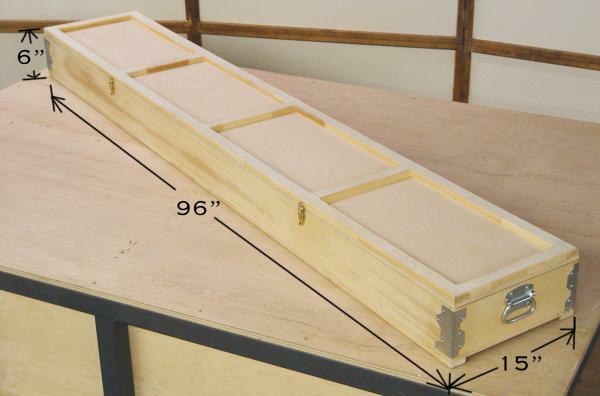 Click here to see a video of our track being asssembled. The Freedom Tracks come with an unconditional guarantee: No matter how old your track is, if you feel you haven't gotten your moneys worth, we will do what it takes to make it right! 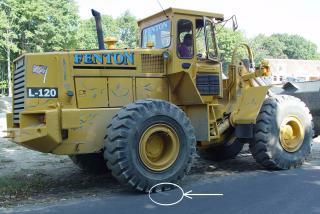 We thought we would demonstrate the toughness of our track by driving over it with a front end loader. No other track on the market can survive this test. 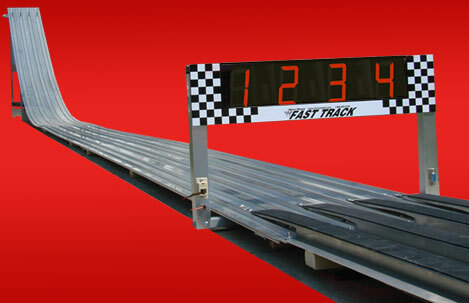 We only carry Anodized Tracks to protect the aluminum surface of your track. 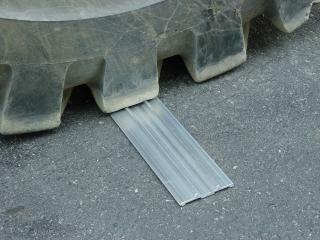 Our experience has been that even after ten years the anodized track looks like new. We believe in the anodizing process so much that if you get a scratch on the surface of your anodized track, ship it to us and Derbywizard will replace it for only the price of shipping. 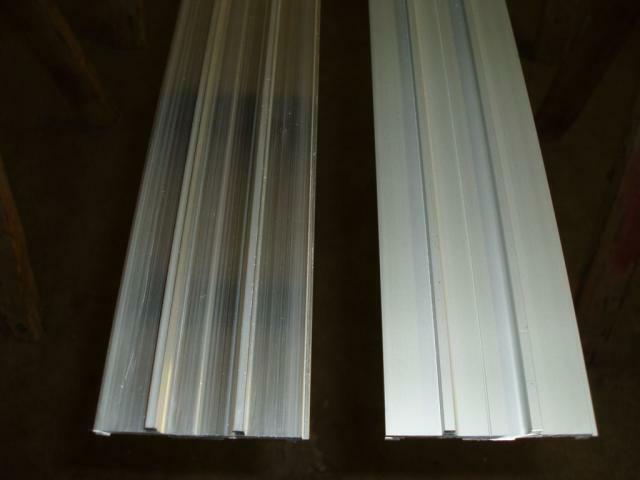 For information on the anodizing process click here. You may call our office to request a free sample of our track to see for yourself the quality and workmanship of our products. You can choose from 2, 3, 4 or 6 lanes and from 32’, 40’ or 48’ lengths. You can add additional lanes and length anytime in the future. - Our newly designed Light Tree & Automatic Gate Release is an exciting way to start your races. - Have our Fast Track Timer Guarantee: Within 3 years of the date of sale, you may return your Fast Track Timer for repair at no cost. - We have technical support 24 hours a day - 7 days a week . - Our timers are very accurate. Timer accuracy information. - Are not affected by photo flash - we guarantee it! You can choose from 3 timer styles with different displays and functions to fit your wallet and individual event! This timer lets you know the order in which the cars finished with red flashing lights that can be seen from both sides. First place is designated with a steady light, second with a flickering light, third with a slow blinking light and fourth with the light off. - Available for 2 to 4 lanes. - Comes with 9v power adapter to plug into any standard outlet. - Has the ability to send actual times to a computer with the purchase of the Computer Serial interface option. It costs $, and comes with a remote start switch (RS), USB to serial converter (USB) and 50 foot computer serial cable (SC) (extra 50' long cables are available for $). It also comes with extra computer options. See the individual timer pages for more information. - Easy to see and easy for the kids to understand. - Comes with a Start Switch (RS), Cable and a 9v power adapter to plug into any standard outlet. - Available for 2 to 6 lanes. - Sends actual times to a computer! Comes with a USB to serial converter (USB) and a 50 foot computer serial cable (SC) (extra 50' long cables are available for $). It also comes with extra computer options. See the individual timer pages for more information. - This timer displays individual times from start to finish to the thousandth of a second, and will alternate to sequence-of-finish. - Comes with a Start Switch, Cable and a 9v power adapter to plug into any standard outlet. - Available for 1 to 6 lanes. We have a wealth of options for our timers. To help you decide which product fits your needs, visit our "How to choose a timer" page. - If viewing the race results from the front and the back of the timer is an option you would like, our Double Vision Option is available for the K2 and K3 models. - For your Derbywizard Timer that has the computer serial interface option, we have the Remote Time Display that shows lanes times and place of finish anywhere you set it (It comes with a 50' cable). No computer is required although you may use one with it. - Since very accurate race starts are important, we carry a Laser Start Gate that projects a laser beam across the starting line. 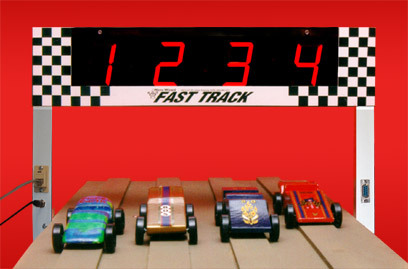 When the cars are released, they interrup the beam and the timer begins counting. Very high tech! - If you purchase a timer with the Computer Serial Interface (which only sends the race times to your computer), you might be interested in Race Management Software. We sell the GPRM - GrandPrix Race Manager Pro Software that allows you to run races based on fastest or average time, plus much more. Derby Day! software package is also compatible with our timers. It is free and available directly from their website. - Is your race outdoors or away from an electricity source? Our Battery Pack is the answer! It uses 6 "C" batteries (not included) for hours of racing.